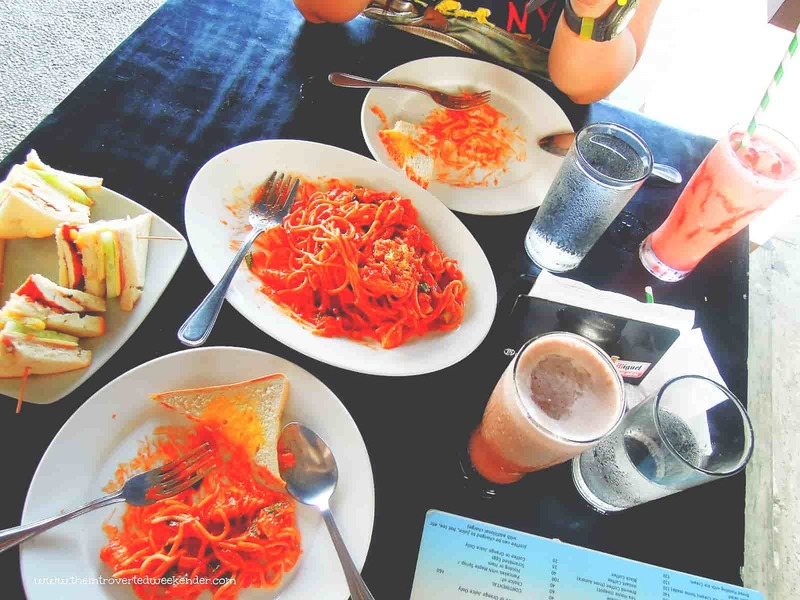 This Baler Food Guide does not really cover all restaurants in town but we compiled this list to help travelers easily find the best and most popular restaurants. When in Baler, the options on where to eat seem endless. There are numerous food stalls in the town proper as well as restaurants around the urban center offering a good variety of flavorful dishes and price points that fit one's budget. 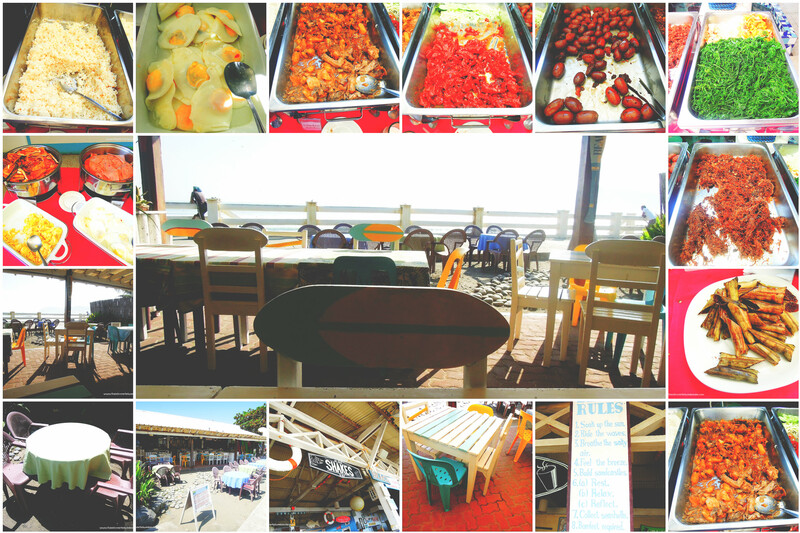 Another thing that we love most about Baler was that food in most restaurants were affordable, had hefty servings, and were of good quality. After exploring Diguisit Bay, Ermita Hill, and Aragon House, we decided to stop by at Yolly's Ihaw Ihaw for lunch. We were told by Kuya Boyet that Yolly's is one of the more popular restaurants in town. 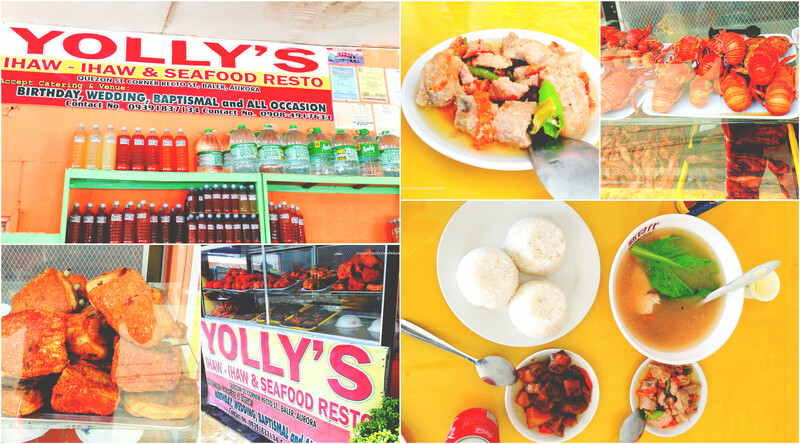 Yolly’s offers native dishes such as adobo, pakbet, pork and maya-maya sinigang, Bicol express and menudo, to name a few. They also offer grilled dishes like squids, crabs, shrimps and liempo. In terms of taste, you can be assured of delicious, home-cooked goodness. Food is around Php60 to Php150 per serving but the seafood selections are a bit on the more pricey side. Picnic Bay is an affordable eat-all-you-can restaurant offering delicious native cuisines. This restaurant is also owned by Gerry Shan of the well-known Gerry Shan’s Place in the town proper. Food here is really good and reasonably-priced at Php250++ per person. It’s along Sabang Beach so expect to be serenaded by the sound of pounding waves and the relaxing sea breeze. 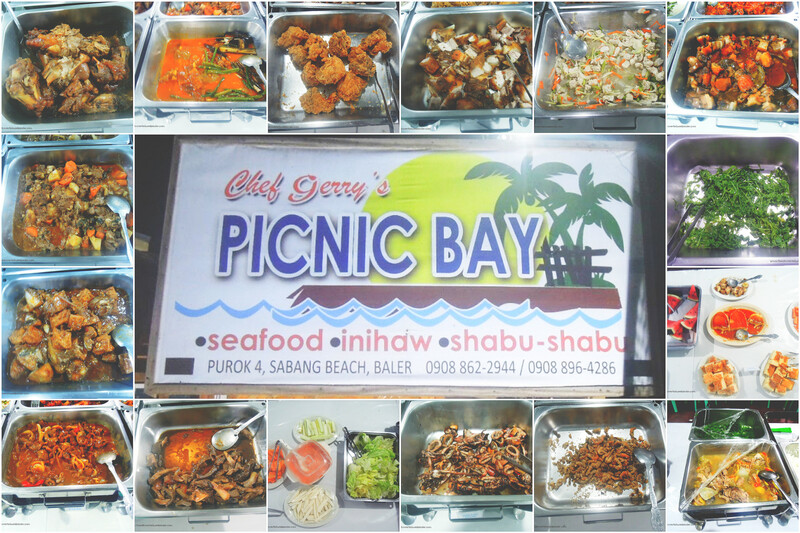 Picnic Bay's selection of soup-based (sinigang, nilaga), meat, vegetable and seafood dishes is extensive. Standout dishes were the crispy squid, lechon kawali, sisig and kilawin. Dessert of fresh fruits, native cakes and leche flan, and unlimited pitcher of iced tea are also included. Our accommodation package in Casitas Bed and Breakfast included a buffet breakfast at the Hungry Surfer Restaurant, run by its sister-lodge, Bay’s Inn. It was a hearty breakfast of garlic rice, eggs, Baler longganisa, tocino and pako salad. 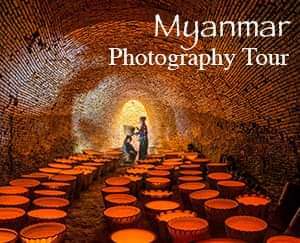 Bread, suman and coffee are available as well as juices and iced tea. What’s nice about the Hungry Surfer Restaurant is that it provides a lovely morning view of Sabang Beach. 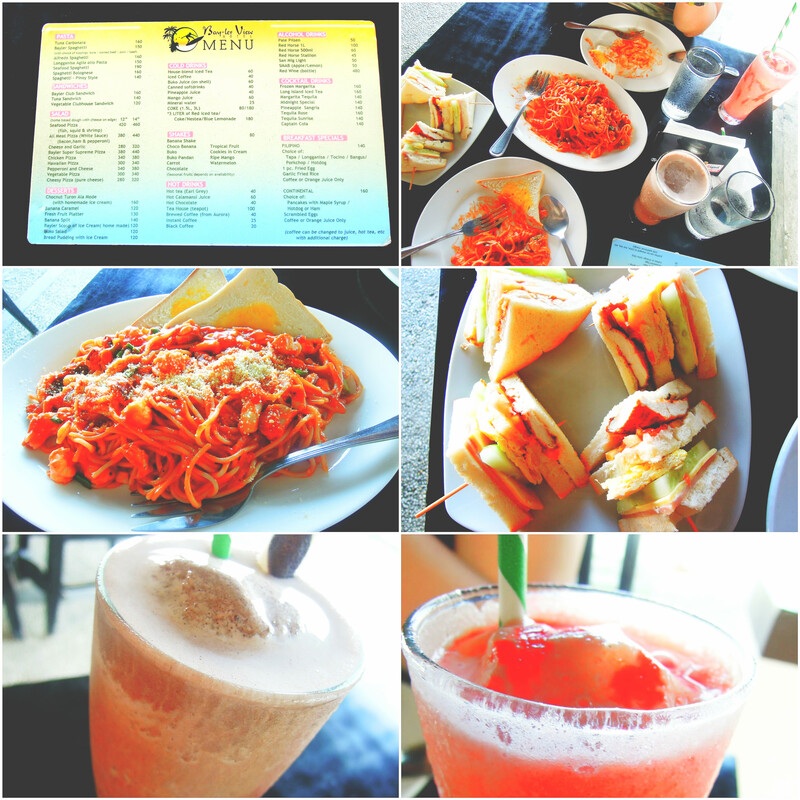 Hungry from walking along Sabang Beach, we stopped by Bayler View for merienda. They offer one of the best seafood marinara we have ever had. Their club sandwich and shakes were also notable. Thank you for dropping by, too.